AS SOON as he finds himself under pressure or when things just don’t seem to be working for his team, one glance at his left arm tells Aaron Cruden not to panic. For taped to his wrist in every match is his patient number from the time he spent in hospital battling cancer. One look at that is enough to remind Cruden that he has overcome bigger challenges than those he is being confronted with right now and that he should fear nothing he faces on the pitch. It was in January 2008 that Cruden first felt a lump in his left testicle. Concerned, he went to see his GP but the doctor couldn’t feel anything and sent him home. Eight months later the 19-year-old sought a second opinion, believing the lump had grown in size, and an ultrasound confirmed there was a tumour. There was worse news to come: the cancer had also spread to his lungs. So as well as having his left testicle removed, he had to undergo chemotherapy. Cruden has been in remission for nearly two years but still has regular check-ups. Being so ill has given him a fresh appetite for life and he even refuses to point the finger at that first doctor. It’s a testament to Cruden’s determination that just seven months after receiving the all-clear, he was lifting the Junior World Cup after leading the New Zealand U20 side to glory in Tokyo. This year his form for the Hurricanes in his debut Super 14 season was too good for Graham Henry to ignore and the 21-year-old was selected in the All Blacks squad for their June fixtures against Ireland and Wales, as well as the Tri-Nations, and has won six caps to date. With all those achievements under his belt, it’s something of an understatement when Cruden says “rugby has taken off” since regaining his health. Yet like so many pro players, rugby wasn’t the first sport to engage the young All Black. Cruden participated in football at a young age but watching his dad, Stu, play at No 8 for Palmerston North College Old Boys inspired him to pick up a rugby ball aged ten. He started on the wing, moved into midfield, then settled at fly-half. He cites his parents as his biggest influences with their unyielding support and honesty. They never pushed him, letting him make his own choices, and they always provided candid verdicts on his performances. His mum, Missy, even sends him text messages before games with little pieces of advice. “That’s the relationship I have with my mum and I cherish that. When she doesn’t send a text I always get in touch with her to ask her why not. She’s been around footy a long time so she’s clued-up. She usually says things like, ‘Do the basics well, don’t overplay your hand’ and it definitely helps my game. “My parents have always been there for me and they tell me if I’ve played well or not. They’re very honest with their feedback and don’t try to make things sound nicer than they are.” While Cruden clearly had talent on the rugby pitch, nobody was rushing to offer him a Super 14 contract when he left school in 2006. Missy managed to get him a building apprenticeship because “she didn’t want me lying around the house not doing anything”, but after six months he found that it wasn’t his ideal career path. He did a couple of courses in business before making the Manawatu team for the 2008 ANZ Cup. The cancer delayed his progress but the ability that earned him the IRB’s Junior Player of the Year award in 2009 caught the attention of the New Zealand franchises and more than one offer was forthcoming. “I grew up watching the Hurricanes, and Manawatu is in that region, so I’m happy I made the right decision. The Super 14 is really good but really challenging. It’s great to be playing with and against world-class players, and I learnt a lot throughout the season. Henry has been impressed by Cruden’s confidence and ability to call the shots, even likening him to All Black legend Grant Fox. Cruden doesn’t have the same affinity with goalkicking as Fox, however. His inconsistency in front of the posts is the glaring flaw in his game and something that he’s striving to improve with kicking coach Mick Byrne. He may have spent the summer as Dan Carter’s understudy, putting in cameo appearances towards the end of matches as New Zealand comfortably saw off northern hemisphere opposition and waltzed to a tenth Tri-Nations title, but he made his first Test start against Australia last month as Carter was injured. And this taste of Test rugby has made him hungry to play in next year’s World Cup on home soil. “This year was my first year in the Super 14, so I was just hoping to get some games under my belt; I wasn’t thinking about the All Blacks. It was the Maori’s centenary and I thought I might make that squad, but when I found out I was in the All Blacks squad I was overwhelmed. Cruden realises that he’s unlikely to surpass Carter as his country’s first-choice No 10 but he’s content to keep learning from the master, a tutorial that should continue on New Zealand’s Grand Slam tour of the British Isles next month. 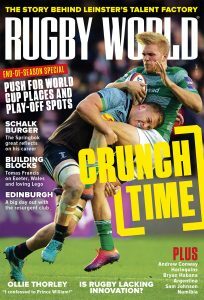 Cruden’s quiet resolve is sure to drive him forward on the international stage and when things don’t go his way selection-wise, a quick look at his wrist will remind him that his contest with DC for that black No 10 shirt will never be as tough as his battle with the Big C.
This article appeared in the November 2010 issue of Rugby World Magazine.